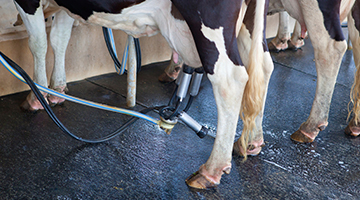 Dairy facilities have unique needs when it comes to flooring. Slip-resistance and traction are especially important for the safety of facility personnel. Whether milk tanker unloading areas, chiller and storage rooms, pasteurization and production rooms or even in the milking parlors themselves, dairy processing facilities present ongoing slip hazards. Wet, damp floors mixed with fats and oils are the perfect recipe for slip-and-fall accidents. Florock’s flooring systems are fully adaptable to meet the rigorous environment of dairy processing facilities. Cheese and dairy processing facility floors present an ongoing slip-and-fall risk. Additionally, acidic organic fats, lactose, dairy proteins and by-products corrode weak or bare concrete floors. These are absorbed deep into concrete slabs, further damaging the concrete. Moreover, vibration from large processing machines as well as regular traffic from pallet trucks and forklifts can weaken the structure of a compromised concrete floor. The appropriate flooring for a dairy processing facility must not only meet these demands, but also provide an exceptional lifecycle value. Systems like Florock’s FloroCrete are especially designed to address all of these needs and more! Our concrete resinous flooring systems are formulated to create a safe environment for dairy processing facilities and their personnel. 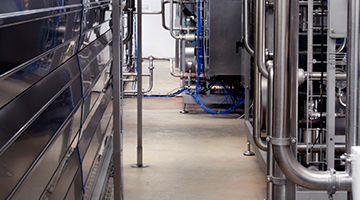 Ever-changing conditions of alternating wet and dry processing, the acidic nature of dairy, along with heavy usage of equipment, require durable floor coatings that support sanitation, facilitate cleaning and enhance safety. Our color-match specialists can also create flooring that will coordinate and enhance the look of any cheese or dairy processing facility. Let an experienced Florock Technical Representative advise you on the best flooring options for dairy processing operations.